In its 64-year history, Condor Cycles has made bikes not only for top pros but also for rock musicians, fashion designers, soap stars and TV chefs. Last year, the London firm received its biggest showbiz order to date: to recreate the bikes of the 1990s professional peloton for Working Title’s forthcoming Lance Armstrong biopic. With shooting now finished and the film, which is based on Sunday Times journalist David Walsh’s book Seven Deadly Sins: My Pursuit of Lance Armstrong, in post-production, most of the replica bikes — minus their decals — have just gone on sale via UK bike shop Ultimate Cycles. Condor’s Claire Beaumont told Cycling Weekly how one of the film’s props buyers came to the shop to buy some retro team racing caps and ended up ordering 25 bikes. “She was more used to working on period dramas and had worked on The Queen with Stephen Frears [who also directs the Armstrong movie],” said Beaumont. “They’d been scouring the internet for about a year trying to find bikes to make up the peloton shots and they just couldn’t do it. They wanted 50, but we didn’t have enough stock. We had in the UK 18 Classicos [models] and the rest in Italia RCs. They only gave us two weeks to deliver them, so we didn’t have time to get more from Italy. 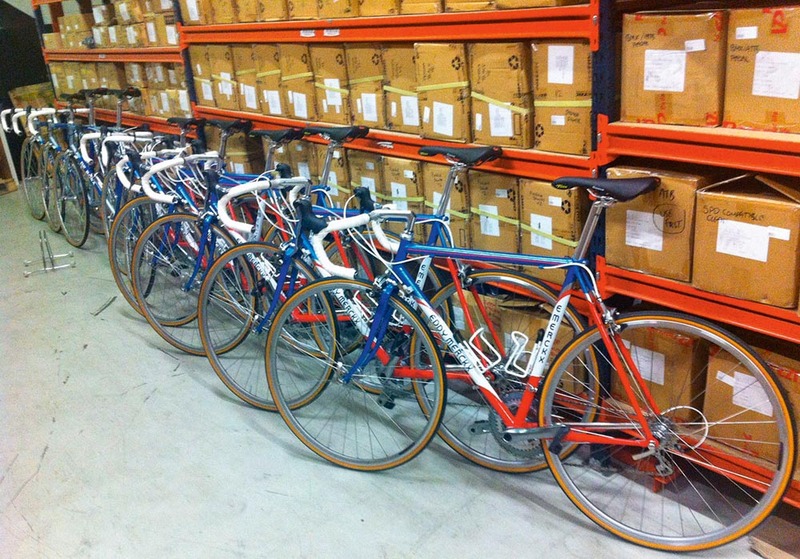 Condor created bikes for scenes from the beginning of Armstrong’s career in 1992 through to 2004, which meant an enormous amount of work for Condor’s designer Ben Spurrier and the Condor mechanics, who resprayed and built up the 25 bikes with modern groupsets that matched the old versions as closely as possible. “We had to try to limit the number of Shimano-sponsored teams bikes we recreated,” said Beaumont. “Nineties Dura-Ace looked totally different, so we tried to look for teams that used Campag because the lever body is pretty much the same; the cable has always been under the bar tape. For the respraying, Beaumont said Condor’s team used a combination of old photos and YouTube to recreate the authentic detail from the time. Condor didn’t try to recreate the Treks ridden by Armstrong — who is played by Ben Foster — and the US Postal team, but helped the film’s props department source them, then advised them on set-up. Condor’s mechanics also built 25 sets of wheels: silver or black rims on silver Campagnolo Centaur hubs. These wheels would actually be used on the cobbles for the Paris-Roubaix scenes, so had to do more than just look the part. Were the Condor team satisfied with their handiwork? “I think the really keen-eyed enthusiasts will pick holes in it, but the film isn’t for those people — it’s for the general public who don’t understand how Lance Armstrong got away with cheating for all those years and who don’t understand how cycling works,” said Beaumont.